Total Score: 9.00 + Best Value! 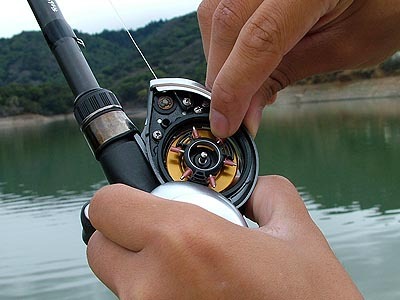 Introduction: The Shimano Chronarch series of reels are a favorite among anglers of all levels, and finding a worthy successor for the series is no small task. Shimano's latest Chronarch is the new 50Mg, smaller sibling of the current 100Mg, and is designed to dispense a new level of overall refinement, ergonomics, and durability. Impressions: Unlike the 100Mg, the 50Mg doesn't look anything like the current Chronarch or the new Chronarch B. This reel is essentially the US's very own magnesium translation of the legendary Scorpion. In the past anglers stateside have had to order the Scorpion through specialty tackle vendors if they wanted to take advantage of the reel's unique features or simply wait and hope the reel would finally arrive. Well....the wait is officially over. The Chronarch Mg immediately differs from traditional Chronarch offerings in that it comes in a very unique plastic retail box. Inside you will find a reel bag, a Shimano wrench, extra VBS brake-weights, reel foot protection seals, and a small bottle of oil. When I first removed the reel from the package I noticed immediately how light the reel was. Weighing in at only 5.9oz this reel is exceptionally light. To really put it into perspective the Chronarch 50Mg weighs 0.3 ounces lighter than the premium TD-Z 105H! 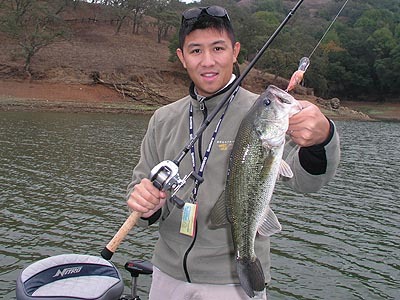 With a full spool of 10lb Trilene BG the reel still weighed only 6.1oz on our digital scale. In my opinion the new Chronarch 50Mg looks sleek and stylish, and is certainly more aggressively formed than the current 100Mg. 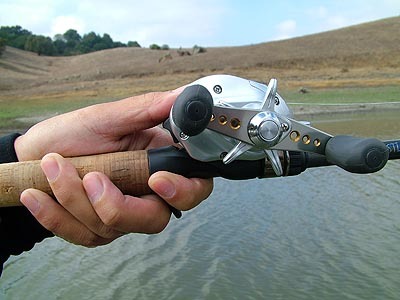 The overall reel is more compact, and the handle is also noticeably shorter. The Field Tests: We were eager to put the Chronarch 50Mg to the test, and wanted to choose as light a rod as possible to pair up with this lightweight reel. We ultimately deicide to match the new reel on a Kistler Helium (HE69apc) for a truly feathery combo. Together the rod and reel weighed in at only 9.6 oz, which is actually lighter than a lot of reels by themselves! 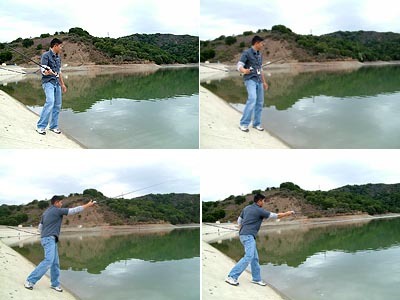 Though we conducted a series of distance and power tests we decided to focus our review on finesse fishing. We set out for a full day of cast tests, and extensive field testing on various local bass lakes with downsized cranks and plastics. Casting: The Chronarch 50Mg is a respectable caster, and is right along the same level as its predecessor. 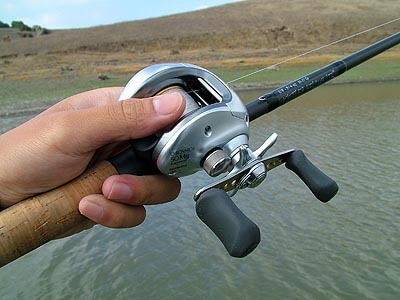 The reel makes use of Shimano's A-RB bearings but the overall bearing count remains the same as the 100Mg. 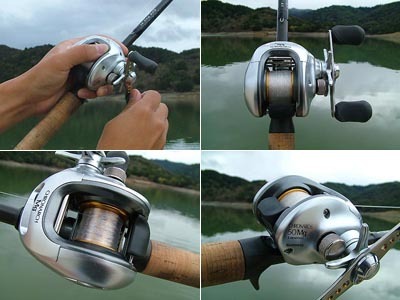 We would have loved to see Shimano add in a few bearings to further improve the silkiness of this reel, but we really couldn't complain since the combination of Super Free and the low-mass drilled spool enabled the reel to feel smooth on each and every cast. The Chronarch 50Mg's VBS system allowed for a complete range of friction adjustments, and this version of the VBS is slightly different than the traditional variable brake system in that the spool has a new-fangled notched washer. Push the brakeweights up into the grooved waster and you have set the brake to the "on" position. The new washer does a better job holding the brakeweights that are not deployed in a true "off" position. Overall distance was decent, while accuracy in flipping and pitching was superb. This is a great reel to use when fishing tournaments or during long full days of repetitive casts. After hours of tossing lures of all sizes I experienced no fatigue in my arm or elbow at all. The reduction of weight is enough that you actually truly feel the difference, and your wrist will thank you for it. 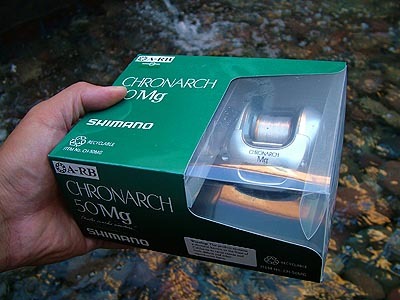 Retrieve: Shimano focused on refinement when they built the Chronarch 50Mg and it shows. The retrieve on the Chronarch is smooth and quiet, and I felt much more connected to weightless plastics than I have ever felt when employing the older 100Mg. 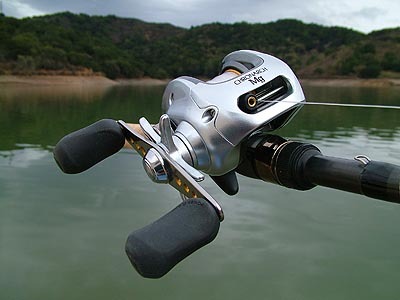 The reel can feel a bit hollow at times, but the feeling is somewhat deceiving, in that the reel still feels solid when cranking hard or fighting a fish. Though the body is magnesium I never once felt any indication of flex at all. The Chronarch 50Mg is almost as fast as the 100Mg with a 6.2:1 gear ratio but the new reel is certainly not as powerful as the 100Mg as the reel bears a shorter handle, reducing overall leverage. When fighting fish this didn't seem to be a big deal, but when retrieving sizeable crankbaits over a long period I did find expeditious cranking a bit more trying. But it is important to note that though the handle on the Chronarch 50Mg is shorter than the one supplied on current Chronarchs, it is actually the exact same length as the one found on the Daiwa TD-Z 105H. This is in many respects a true finesse reel, and an excellent choice for fishing 8 to 12lb test line. What I am most fond of about the Chronarch 50Mg is the connection you feel to the lure at the end of the line during retrieves. Mounted on a quality graphite rod like our Helium, the reel almost seems to translate the very vibrations felt through the rod itself. I worked tiny crankbaits in and around branches with poise, as I could feel each and every impact with structure. The same can be said about detecting strikes. Early in our tests I was casting a weightless rigged Yamamoto Kreature, and dragging it slowly across the bottom. I felt the rough bottom, bumps against rocks, thick vegetation, and even as I was negotiating a rocky ledge I experienced a clearly identifiable strike. Within a split second I lifted the rod and set into a nice 3.5lb bass and worked her into the boat. Drag: When I first looked at the Chronarch 50Mg's star drag I was disappointed at what looked like plastic, but upon closer inspection the drag appears to be well reinforced and coated as well. It looks so good that we originally thought this drag to be constructed out of magnesium, but now believe that it is in actuality a composite plastic material. I was thrilled when it was revealed that the new drag featured a clicker, something I never understood why was left out on the original 100Mg. The actual drag washers delivered ample pressure for combating largemouth, and big bass stripped line out of the reel at an even and constant rate. Ergonomics: The Chronarch 50Mg suddenly makes the traditional Chronarchs look utilitarian in comparison to the slick design found on the new reel. 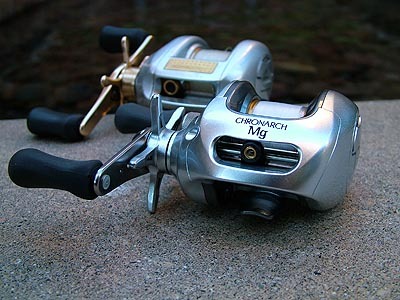 The Chronarch 50Mg features a recessed reel foot that makes for a very "close-to-rod" sitting. When mounted on a Fuji reel seat the reel is within easy reach of your thumb, and palming comfort is exceptional. Cranking comfort and grip are further improved with the use of Shimano's power knobs. 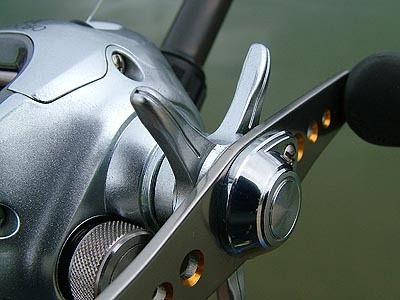 The 100Mg makes use of flat symmetrical knobs while the Chronarch 50Mg of the ergonomically enhance "Power Grip" knobs found on the Calais and Calcutta TEDC reels. Whether you are casting long distance crank baits or flipping jigs you will find the Chronarch 50Mg comfortable and effortless to operate over extended periods of fishing. Durability: Now to the big question...is this reel going to last? No doubt you have heard the horror stories about the surface of magnesium reels becoming pitted after contact with brackish or saltwater. This simply isn't the case with the Chronarch 50Mg. In fact Shimano has rated this reel for saltwater. How is it possible? The answer lies in the sophisticated coating process. The Chronarch 50Mg doesn't look or feel like other magnesium reels which are matte to the touch. Instead the Chronarch 50Mg feels slick, as the magnesium is protected under a shield of gloss. This coating still requires attention, and the reel should always be properly wiped off after use, and special care should be made not to scratch the surface coating and expose the raw magnesium. Shimano includes two protection seal labels that go on each end of the reel foot as an added precaution to potential damage done to the foot from metal reel seats. This coating widens the number of applications anglers are capable of tackling with this reel, and while we don't recommend inshore salt fishing, you should be able to fish brackish conditions with assurance. Price: Finally the issue of price. At 249.99 this reel is in the mid range of baitcasters and affordable to most anglers. When you consider the features, magnesium body, and incredible low weight, the price doesn't seem prohibitive at all. Quite the opposite in fact. There are few reels that can match Shimano's new lightweight performer when it comes to true magnesium construction and refinement. Conclusion: After fishing with the Chronarch 50Mg the only thing I can say is that I wish Shimano had brought this reel to the US sooner. While the reel may not deliver the same level of power as the current 100Mg it more than makes up for it in terms of commendable weight reduction and vastly improved ergonomics. Weighing in at only 5.9oz this lightweight reel delivers heavyweight performance when it comes to finesse fishing with lighter lines. The reel feels great when palming and attention to detail on this reel is impressive. While we hoped that Shimano would have upped the bearing count, and could offer a standard length handle option we understand the necessity to reduce weight, and preserve a compact body with similar dimensions to the TD-Z which costs a 100 dollars more. The thick anti-corrosion coating is a big plus, as it allows many anglers who would have normally turned away from magnesium due to durability concerns to consider this quality reel. In the end it boils down to value, there is a short list of good magnesium reels out there, an even shorter list of those weighing under 6oz, and none that do so under 250 dollars. It is for that reason that the new Chronarch 50Mg is the first baitcaster this year to walk away with a coveted TT Best Value Award.